BMW will be the second-largest auto advertiser during this month's Winter Olympics. 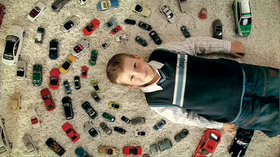 One of the company's ads features auto enthusiasts of all ages. ORLANDO -- BMW Group is using the Winter Olympics to launch a marketing campaign to convince shoppers that BMWs are engineered well but are fun to drive, too. George Sharpe Sr., chairman of the BMW Dealer Forum in the U.S. and president of Sharpe BMW in Grand Rapids, Michigan, said the brand's make meeting at the U.S. National Automobile Dealers Association Convention this month is upbeat -- as might be expected, given the average 2.5 percent net margin on sales that BMW's 378 dealers obtained in 2009. Eitel Dahm, owner of Bavarian BMW in suburban Detroit, agreed: "The economy is picking up, and we have very good products." BMW will be the second-largest sponsor of auto advertising during the Winter Olympics in Vancouver behind General Motors Co., said Patrick McKenna, BMW manager of marketing communications. BMW declined to say how much it is spending. Two BMW commercials are being broadcast during the Olympics. A one-minute commercial, "Story of Joy -- Scrapbook," shows families enjoying rides in BMW convertibles and old photos of enthusiasts with their cars. A 30-second commercial illustrates the aerodynamics and fuel efficiency of BMW vehicles. Peter Miles, BMW executive vice president, said the brand's vital signs are excellent. BMW has products in the pipeline that will refresh much of the lineup in the next two years. He said the redesigned 5-series sedan will be launched in June. Used cars also are profitable for dealers and are drawing new buyers to BMW, Miles said. A healthy 65 percent of BMW used cars are bought from BMW dealers, he said. And 50 percent of the people buying those 160,000 used cars from those dealers in 2009 were new to the brand, he said. Dealers are at the tail end of making $3 billion in store improvements during the past five years, Miles said, an investment that will continue to pay dividends in the coming years.